A new pre-workout from a reputable brand. We take a look at why ON Platinum PRE has quickly become one of the top sellers. When it comes to our training, getting energized and motivated can sometimes be easier said than done. Ever had days when you know you should be going to the gym for a gruelling and intense workout, but you simply do not have the energy, or indeed the motivation to get up off your rear and get it done? If the answer is yes, then you’re most certainly not alone as we all experience drops in energy and motivation from time to time. Often, people resort to cups of coffee or strong sugar filled energy drinks that are not that healthy or beneficial for our bodies in the slightest. A great alternative would be to purchase a good quality pre-workout supplement, but the trouble is, as the health and fitness supplement market is so lucrative and competitive, knowing which product to choose is not easy. One product which has been getting rave reviews as of late, is ON’s Platinum Pre pre-workout supplement, and it is this product which we’ll be looking at in this review. What is ON Platinum Pre? As you’ve probably guessed, Platinum Pre is a Pre-Workout formula, designed by Optimum Nutrition, one of the most successful and popular supplement manufacturers in the entire world. It is designed to give you increased levels of energy, motivation, mental focus, and stamina, to help provide you with intense and extremely productive workouts every time you use it. A serving is only 5 calories and contains less than 1g of carbohydrates. Perfect for anyone on a low-calorie or low-carb diet. How easy does it mix, and how does it taste? The product is extremely easy to mix, and it will easily combine with water with a few stirs of a fork. For maximum mixing results however, it’s advised that you combine your desired serving size with water, in a shaker cup, and then gently shake the mixture for a few seconds. As for the taste, that’s where this product really comes into it’s own. The taste is superb, and would easily pass as a fizzy drink and not a potent and effective pre-workout supplement. Flavours include Superfruit, fruit punch, Twisted Apple, and the most popular option, Raspberry lemonade. What’s in ON Platinum Pre? As it’s a pre-workout supplement, not surprisingly, the main ingredient in this supplement is caffeine. An 8 gram serving will provide you with 200mg of caffeine, so you won’t be short of energy. 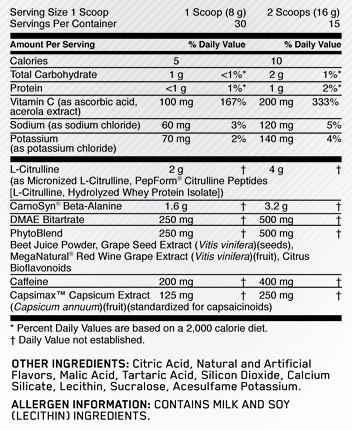 It also contains 1.6 g of beta alanine, per serving. 2g of the amino acid L–Citrulline, a large amount of healthy vitamins and antioxidants and 250mg of DMAE Bitartrate. If this means nothing to you, then rest assured that these antioxidants, vitamins, minerals, and amino acids all work together to help improve your stamina, energy, mental focus, your intensity and even your muscle pumps. Obviously, as it contains stimulants, ensure that you don’t take it too late in the evening, or else you will struggle to sleep as I found out one night, when working out at 10pm. 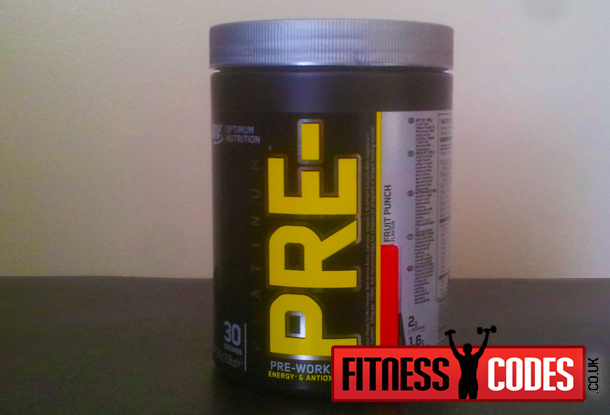 Overall, this pre-workout supplement is one of the best pre-workouts on the market today. It’s made by a supplement company that can be trusted and it contains just the right blend of essential amino acids, antioxidants, stimulants, and other natural goodness that all work together to help energize and revitalise you every time you hit the gym. Your energy and focus will be through the roof, your strength will increase, your stamina will increase, your muscle pumps will be way more pronounced, and you’ll love the taste. A fantastic product and we give it 8.9 out of 10. Where to buy ON Platinum Pre?